In general, the contrast in typical cryo-EM images is still very low. Therefore, depending on the sample and the specific biological question, several post-data collection image processing methods are necessary to improve the signal-to-noise ratio and to generate a 3D reconstruction from the 2D images. The two main techniques that are employed at NeCEN are single particle analysis (SPA) and cryo-electron tomography (cryo-ET). By combining many (sometimes thousands of) noisy images, high resolution structural details can be obtained. SPA and cryo-ET allow scientists to zoom in on cells to the level of molecules and even atoms. The methods are suitable for a wide variety of research applications that can potentially lead to faster and better methods to understand, diagnose, cure, and prevent diseases at a molecular level. 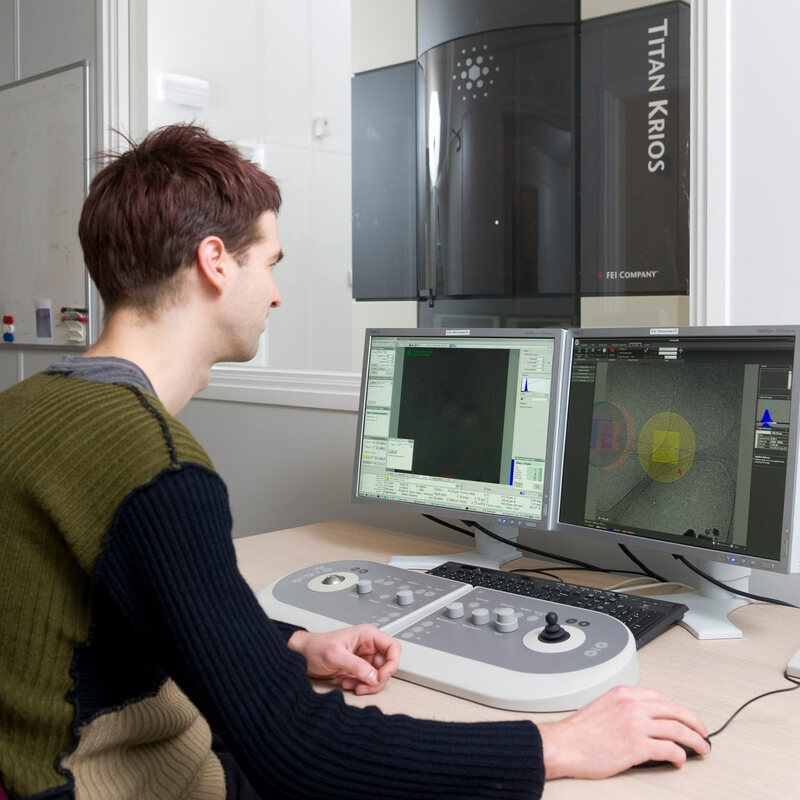 Our complementary Titan Krios microscopes give unique possibilities to perform a very broad range of experiments, ranging from Cs-corrected atomic resolution single particle acquisition to phase plate tilt series acquisition or STEM and diffraction applications. NeCEN's experienced microscope operators in combination with the advanced and highly automated hardware allow the user to get most out of their sample and microscope time. The NeCEN staff will load batches of grids (maximum of 8 grids per session). The loading and setting of the relevant data collection and imaging parameters will take (in most cases) 4 to 6 hours. For each batch of specimen to be imaged, 24 hours are available, minus the time required to load the specimen and to set the relevant data collection and imaging parameters. Automated software will collect data during the rest of the day and overnight. For each project a dedicated operator is appointed who will communicate closely with the customer. The operator will be present during office hours. The customer can choose to be present at NeCEN during data collection or to send vitrified samples to NeCEN. At the end of the data collection project the customer will receive instructions on how to download the data from dedicated servers.